Is a Post-Abdominal Surgery Lump Normal in Cats? Owners of cats who have a routine spay (ovariohysterectomy) surgery often ask if they should be alarmed about a lump in the incision area. Is post-operative swelling under her belly or a hernia-like bump normal or cause for concern? This is a difficult question to answer because some swelling may be normal and it will typically go away over the coming days or weeks. On the other hand, the lump you noticed may also be a sign that something isn't quite right. If you have any questions about your pet's care after surgery or anytime your pet is not well, call your veterinarian as soon as possible. 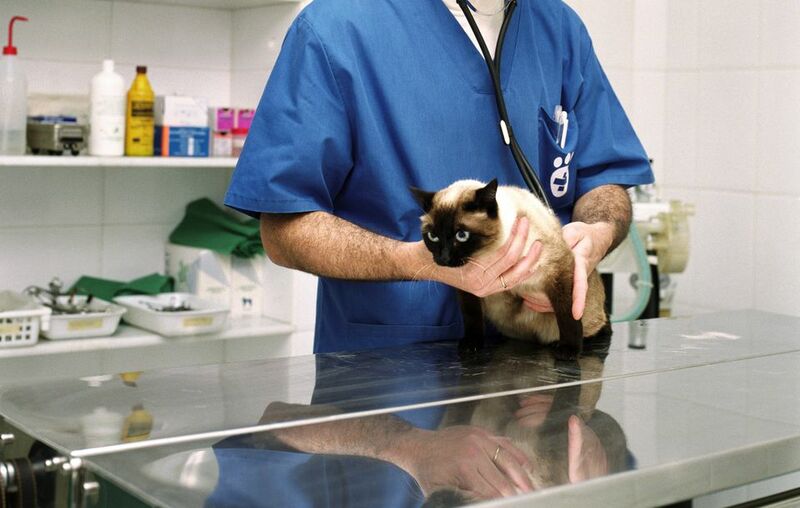 Your vet is the only one who knows your pet and its medical history. For traditional abdominal surgeries, most vets do what is called a three-layer closure. The innermost layer is the strength layer and this closure is sutured up the body wall. The second layer is the subcutaneous layer, a closure of the connective tissue and fat between the body wall and skin. The final layer, the one everyone sees, is the skin closure. Many vets bury the sutures with suture material that dissolves, so there are no sutures to remove. Some vets use surgical skin glue to speed closure and healing. Pets often lick or chew at the suture line. Some animals do it only a few times, while other animals are obsessive about it, possibly removing sutures or causing an infection in the process. Cats are particularly adept at removing sutures before the recommended 10- to 14-day time that it takes to heal after surgery. Your vet will give you specific post-surgery instructions upon discharge. It is important that you read and follow these, making sure you understand everything. What is deemed "normal" after surgery varies with the suture materials used, the doctor's technique, and the patient. This is why those personalized post-op instructions are so important. Before you leave the office, be sure to ask about any specific signs you should look for in your cat. A firm, non-painful swelling under the incision that appears a few days or a week after surgery is fairly common, particularly in cats. This is the body's way of working on the sutures and it is called a suture reaction. Some animals react, but most don't. These types of lumps can take several days or weeks to shrink to normal. Serious changes that you need to keep in mind include redness or discharge (often green-yellow or red) near the incision. While the lump may be normal, if it seems to be growing, you notice other swelling, or her skin is warm to the touch, these are causes for concern. Additionally, watch your cat for signs that indicate she is in pain, becomes listless, or is not eating. Good communication with your personal veterinarian is key after any animal surgery. However, there are a few general tips that can help ensure your cat has a successful recovery. Prevent Licking: Cats groom themselves all the time, but their tongues are also filled with bacteria. Do your best to prevent your cat from licking the surgical site. If needed, an Elizabethan collar (sometimes called an "E-collar" or "the cone") can be used during the healing time. Though she may not like it at first, most cats get used to it. Limit Activity: It is important to keep your cat as inactive as possible while she's healing. Vigorous movements or excessive play can cause the incision to open up. It's often best to confine her in a quiet room or spacious carrier when you won't be around to monitor her activity. Also, try to maintain calm in your household to help keep her at ease. Close Hiding Spots: Surgery can be a traumatic event in a cat's life (though they quickly get over it) and many cats instinctively want to hide after the experience. If she does this, you may not be able to monitor her properly. Do your best to close off any places in your home where she can potentially hide, such as closets, the basement, or under furniture. Monitor Carefully: Over the two weeks that she's healing it's important that you keep an eye on all of your cat's activities and her body. Inspect the incision site one or two times a day so you can recognize any changes. Inspect her urine for blood (a tiny bit may be normal in the first 24 hours) and her stool for any abnormalities. Look for those warning signs mentioned above such as her appetite, discharge, or swelling. Administer Vet Meds Only: Included with your post-op instructions, your vet may have prescribed pain medication or other home treatments for your cat. It's important that these are the only things you give her. Never give a cat human medication or apply any ointments, creams, or similar products to the incision site. Avoid Baths: This is more of a concern for dogs, but some cat owners give their cats a bath as well. Do not do this while she's healing because the water may open up the incision. ASPCA. Caring for Your Dog or Cat After Surgery. 2010.